Few years back my wife got an Eee PC . We were both in graduate school at the time, and he would just throw the laptop in his small bag, pop it out in class, and use it to take notes. I was incredibly jealous. I loved the fact that it was smaller than a standard laptop, super lightweight, simple and affordable. I bought mine about 6 months later, and I got a newer model for the same price. 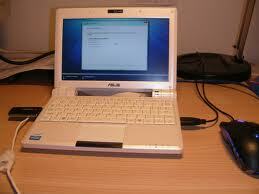 I love my Asus Eee PC 900, and it is still going strong. For the past year and a half, it has been my primary computing device. It is too small to have a CD drive, but there are three USB ports. The keyboard is smaller than standard, but I have small hands. After about a week of typing on the Eee PC, I could type as easily and quickly on this small keyboard as I did on a standard size. The speakers on this model are not great, so I use headphones most of the time. Obviously this computer is not as powerful as larger, more expensive machines, but it has definitely been worth the $400 I spent. It has an integrated 1.3 megapixel web cam. My Eee PC came with 16 GB SSD, which has been plenty for my needs. It also came with a free sleeve/case. My father-in-law also bought an Eee PC around the same time, and he uses his often on the airplane. It is the perfect size for travel. Overall, I am very pleased with this laptop and would definitely recommend it to anyone looking to purchase a small and simple device. I look forward to buying another Asus laptop in the future.